Back in 2014, I had no idea what awaited me. I was leaving teaching after 30 years and was looking forward to sleeping past 4:30 a.m., relaxing, traveling, enjoying grandchildren, and writing. I had actually already written a book that needed some further editing, and I was hoping to find a way to get it published. And then, OILS! A good friend of mine introduced me to Young Living Essential Oils, linked her arm in mine, and escorted me into a new business! I was interested but tentative. My reservations about starting a new business didn’t last long. First of all, I love the essential oils. I had always been sensitive to smells—cleaning products, hair sprays, candles, and so many things. Now I had a diffuser which dispersed beautiful aromas into my home without causing sensitivity issues. And the bonus is aromatic benefits. Second, the business aspect grew very quickly. My family fell in love with the oils and the health benefits. Soon friends and extended family were involved, and I haven’t looked back. Additionally, this business has expanded my horizons, given me an outlet for writing, taught me many new things, and blessed me with many new friends. Though the financial benefits are there, I believe the health benefits are even more rewarding. I have purged my home of many chemicals by replacing cleaning products, skin products, food products, and daily supplements. I live a much more conscious healthy lifestyle because I have been educated. Essential oil use needs to accompany other healthy lifestyle choices. My goal when I started was to focus on my health, and I have found essential oils helpful as I increase my exercise routine, improve my eating habits, get an adequate amount of sleep, and reduce the stressors in my life. For me, this business is about partnering with those who are on a journey to better health and looking for a cheerleader to come along side to provide education and support. This week, Young Living upgraded their popular Premium Starter Kit. I’m excited about it because they have re-introduced two popular essential oil blends to the kit. It now includes 12 essential oils, a diffuser, samples of their popular antioxidant boosting drink, Thieves Household cleaner, and more. With one collection, you can begin your own journey to transforming your home and your health and decrease your exposure to harmful products. I believe people have an increased awareness of the benefits of choosing a healthy lifestyle. Not only do healthy choices increase your longevity, but also your quality of life, your energy, and your outlook. Health products abound in today’s market, but I believe I have chosen the best ones. If you have never explored Young Living’s Seed to Seal promise or essential oils, I’d love to share with you what I have discovered on my journey. Whatever your choices, make them for your health. September 29 is World Heart Day! There are many ways to improve your heart health; so, rather than writing about heart health myself, I decided I would point you to the experts. I hope you will check out some of these links, as I did, to read more about how you can take care of your heart. Preventing an early death from heart disease will lower the risk of your loved ones being broken-hearted. Did you know the leading cause of death among women is heart disease? What are you doing to improve your heart health? Motivate yourself to make some changes by getting involved. Check out this contest sponsored by Young Living to encourage heart health. Working with others toward a similar goal will help keep you accountable. How can you prevent heart disease? You can reduce your risk up to 80% by changing your lifestyle, according to Go Red for Women. Walking for 30 minutes a day, getting enough sleep, taking control of your eating, and avoiding salty foods and unhealthy fats are some ways to begin. Check out their website for more details. What steps will you take for your heart this month? What changes will you make? Don’t ignore the warnings. Make a change today. My heart, your heart! September 29th! I’m going to walk for 30 minutes now. Have you been outside in the sun and heat a lot this summer? Your skin may need a little fall TLC. And as the weather cools and the air conditioner is replaced by the furnace, your skin may need some extra moisture to keep it from drying out. Here are some skin care recipes sure to put you in the mood for hayrides, campfires, apple cider, baked goods, and long walks. And as the seasons change, you can change the essential oils you add according to your personal taste. Need essential oils? You can get them here. Directions: Combine sugars in a mixing bowl. Mix oils and honey together in a separate container. Combine liquid mixture with sugars in mixing bowl and stir until it reaches desired texture, adding more oil or sugar if necessary. Baking soda may be added to soften consistency. Transfer to Mason jar or other container and enjoy. Directions: Whip shea butter and coconut oil together with kitchen mixer; then add almond oil, or a carrier oil of your choice, to desired consistency. Add slowly as you may not need toe whole cup. Fold in essential oils, using a wooden or stainless steel spoon. Place in a tightly sealed jar. And to help get you in the fall mood, here are some fall favorite essential oils to add to your diffuser. Use them alone, or mix them up. Create your own favorite blends. And , while you are enjoying the fragrance of these beautiful oils on your skin or in your diffuser, it’s nice to know that they are supporting wellness of your body systems! May you be blessed with a healthy and enjoyable fall season. It’s that time again! Back to school. We survived the days of 90+ temperatures and overwhelming humidity in July. And though we still have a full month of summer left, we can’t help think about fall and the upcoming school year—even if we are no longer personally involved getting kids ready. Walking into any store will remind you that education is making its annual comeback. Christmas in July sales have given way to Back to School sales. Mom is sorting clothes to see that Johnny has once again outgrown all his long pants and wondering if he can go to school in shorts until Christmas. Johnny also needs new tennis shoes. And Susie wants a whole new wardrobe because she can’t possibly wear last season’s outfits. But mom is not done shopping. There is the excitement of backpacks, folders, pens and pencils, a new lunch box, and maybe some rain boots. Thankfully, Young Living has some things to make the transition from summer to school year easier and healthier. Here are five tips for a successful start to the new school year. Mom, you are first on the list. Stress Away is a sweet-smelling essential oil blend that will calm you during those shopping sprees with Johnny and Susie. A word of advice from a mom who has been there—if possible, take one child at a time shopping. It saves arguments and sanity. Breakfast and Snacks – Stock up on healthy choices for a quick breakfast or between meal snack. Einkorn Granola – Eat it dry, add milk to make a cereal, or mix in with yogurt and fruit. Wolfberry bars – A great grab and go snack. Ningxia popsicles – Have some of these stashed in the freezer for cooling off when summer temperatures continue into early fall. Einkorn Flour – This Heirloom Wheat flour contains only 1% gluten and bakes up great using your favorite cookie and quick bread recipes. Check back next week for my blog about baking with Einkorn. Focus – Keep essential oils on hand that support cognitive function. Start your day alert and finish with concentration on homework. Try Lemon, Peppermint, or Clarity. Thieves – Support the immune system with a Thieves roller or add a few drops to your diffuser while enjoying some family TV time. Sleep – Keep essential oils on hand that promote good sleep. When it is time to unwind, and the sun is still in the sky, diffuse some calming oils. Try Lavender, Peace & Calming, or Sleepyize to get everyone settled in for the evening. Now that you have your shopping well in hand, it’s time to get out and enjoy the remainder of the summer. School will wait a few more weeks. Yesterday at my grandson’s birthday party, I donned my bathing suit and went in a pool, something I haven’t done in a long time. But it was a 90+ degree day so it was definitely worth it. I even had a squirt gun fight with one boy. And there were lots of boys. . . and squirt guns, nerf guns, an obstacle course, presents, ice cream and party food—you know, the works!! It was a PARTY!! While it was fun to sit back and relax, I couldn’t help but think about wellness and healthy lifestyles. My wellness meter was working overtime. A long afternoon in the sun can be fun, but it can also be detrimental if you don’t take precautions. So, here are some tips for a healthy summer using natural, plant-based products to protect your family. SUNSCREEN – Here’s what you need to know about sunscreen. You NEED to KNOW about sunscreen. There are so many choices, how do you know what to choose? TWO KINDS OF RAYS – Most people look at SPF (sun protection factor) when purchasing sunscreen. SPF is only rated for UVB rays (the ones that cause sunburns.) This is why it’s important to understand that SPF is not the only protection you need from the sun. UVA rays are the more damaging sun rays, as they cause more long term damage and premature aging. To protect you from both types of rays, look for a sunscreen that is Broad Spectrum. SPF FACTOR – Next people look at t he SPF Factor. What level of protection is needed? What do the numbers mean? “If you are wearing an SPF of 2 you will incur that same amount of damage in 2 hours that you would have incurred in one hour without any SPF. An SPF of 10 will get you 10 hours, SPF 30 will get you 30 hours, etc. Here’s the thing, SPF is not linear (i.e. 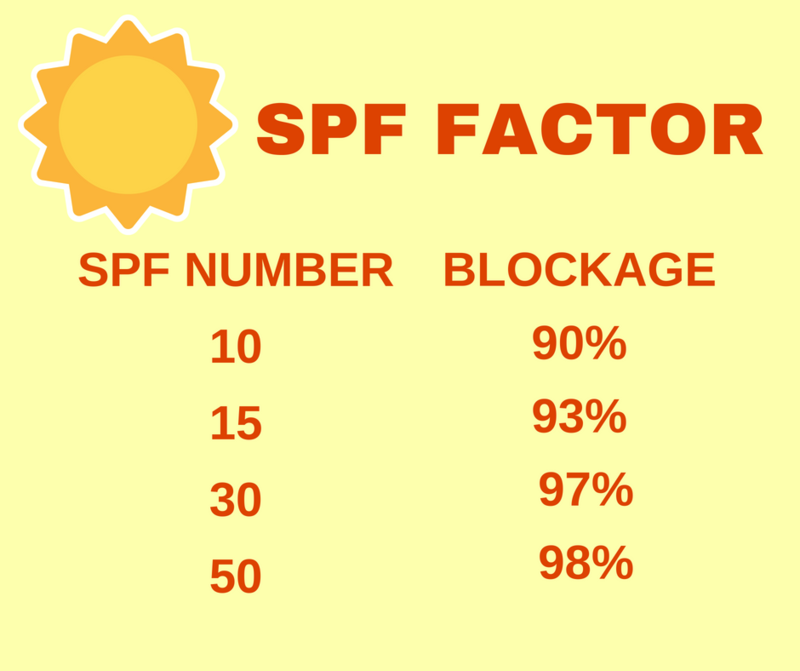 you don’t get 10 times more protection going from SPF 1 to 10 or 10 to 100). When you apply SPF 10, you are blocking approximately 90% of UVB rays. SPF 15, approximately 93%; SPF 30, approximately 97%; and SPF 50, 98%. So applying an SPF of 30 only gives you 7% more protection than SPF 10.” [https://lindseyelmore.com/mineral-sunscreen-lotion/] No matter which level of protection you choose, the number isn’t as important as the application. FREQUENCY OF APPLICATION – Regardless of SPF Factor, sunscreen needs to be applied appropriately and often to be effective. Generally, you should apply every 80-90 minutes. If you are swimming, you may need to apply more often. The higher SPF number does not protect you longer. People often think they don’t need to reapply because they are not burning. However, by not reapplying, they are actually getting more exposure to UVA rays, which are more damaging. But there’s other damage that can be done, even when you are protected. What is IN your sunscreen? SUN HATS – We have been told for years to wear sunscreen to avoid skin cancer, but sunscreen alone is not enough, even when you have a good one. You need to take other precautions. Everyone should wear a hat. A ball cap is good, but a sun hat is better because it covers the back of your neck and your ears, too. I know those of us that grew up playing outside daily never wore hats have a hard time adopting this in practice, even if we agree in theory. But you need a sun hat. Get one. Wear it. You’ll look younger in the long run. Make your spouse, kids, grandkids, and friends wear one, too. It is not fun to have to go and have cancer scraped from your body. I know several people who have had to deal with this. Save yourself the trouble. Buy a hat! UPF CLOTHING – UPF is similar to SPF. It’s a label given to clothes that are considered sun-safe. Is this a good idea? As I began to researching this for my blog, thinking it sounded logical, I discovered disagreement. Here’s why. Yes, covering up is a good idea; however, if clothing has been protected against the sun, then what is in it? Does it have the same chemicals and nano particles that you just avoided by buying a safe sunscreen? Older articles tend to discount this kind of clothing as ineffective, especially after a few washings. A more recent article suggests that washing clothing with UPF can actually increase the protective factor due to shrinkage of fabric. Another article suggests that sun-safe clothing is safe because of the weave of the fabric. If it is tight enough to block the light, then it’s good. Ultimately, most any clothing that covers the body is more protective that no clothing. I remember wearing t-shirts over my swimsuit at times when I was a child. And I often wear a long sleeve cotton shirt these days when I go out to garden. However, don’t just use a lightweight white cotton t-shirt. It only has an SPF of 5. Doctors agree that denim offers the best protection, but who goes to the beach in jeans? SUNBURN TREATMENT – Despite all your best intentions, you were having so much party fun you got sunburned. What do you use to treat your skin? If you are sunburned, you will want something cool and soothing. If you are not sunburned, you still need to put moisture back in your body. Many of the same toxic ingredients that occur in sunscreen are found in other skin care products, so read labels with care and avoid the chemicals mentioned above. Natural products with essential oils are a good choice. And drink lots of water to re-hydrate. INSECTS – What is a summer party without bugs? Insect repellent is something else that goes on your skin. So, guess what? You need to read the labels. If you can’t pronounce it, it probably isn’t good for your skin. A Google search will reveal lots of articles about repellents and ingredients. Some say they are safe; others say they aren’t. What I found interesting from my brief perusal is that the writer/editor usually has some stake in the results, so it is difficult to judge whether the information is unbiased. Peer-reviewed research indicates caution. For general back yard fun, it seems appropriate to me to use more natural, plant-based solutions, like essential oils and essential oil products. CUTS AND SCRAPES – With a crowd full of kids, a cement pool, nerf guns, and the high speed running around a yard that comes with a party, accidents are bound to happen. For soothing and calming skin and crying, it’s good to have a supply of lavender essential oil on hand. You could also use a misting spray that’s good for both cuts and scrapes, as well as sunburns. Again, read labels and make sure you are using plant-based, chemical-free products. TOO MUCH PARTY? – Remember all that party food I talked about? Maybe the kids can handle it, but too much party food is always hard on my digestive system. Add to that a hot day in the sun, and sometimes tummies are not happy. Essential oils can support the digestive system, and I always have a few on hand to meet the need. My favorite is peppermint, but you could also try lemon, fennel, ginger, or a blend of oils for digestive support. Summer activities and enjoying the great outdoors are fun after a long winter. But when you are preparing for that outdoor party, a beach vacation, or any other outside activity, take the precautions you need for sun protection so you and your loved ones can enjoy the party without having to worry about your long term health. With a few wise choices, you will have lots of summer fun for years to come. Ah, my wellness meter is happy now.